National Geographic's map of the Appalachian Trail is ideal for fans and hikers of this magnificent national scenic trail. It makes a great planning tool or as reference to track progress on the 2,200 mile length. Developed in cooperation with the Appalachian Trail Conservancy, this beautiful poster, shows the entire length of the trail from Maine to Georgia. A unique elevation profiles highlight the trail's peaks and valleys and an informative mileage chart shows the distance between key locations. Also highlighted on the map are National Forests, National Park Service lands, State Forests and Parks, and major highways and interstates. Points of interest include Appalachian Trail information centers and shelters. This Kappa Map Group folded highway map of Connecticut and Rhode Island includes insets of: Bridgeport, Danbury, Greenwich, Hartford, New Haven, Stamford, Newport, and Providence. Connecticut and Rhode Island, Golf Road Map by Fore Better Golf, Inc. 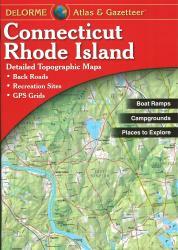 Wondering what to read when visiting Rhode Island?